"Repair bad sectors on your damaged hard disk with HDD Regenerator." The hard drive is one of the most important parts of your PC. It is very important to make sure the hard disk is running correctly and isn't damaged with bad sectors. 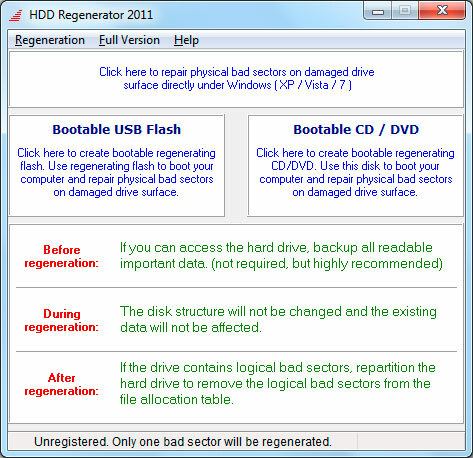 HDD Regenerator uses a unique algorithm which is used to repair damaged disk surfaces. This can help you repair your drive to a healthier state to increase it's lifespan. This would make it so you don't really have to worry about your hard drive nearly as much while having HDD Regenerator monitoring in the background. 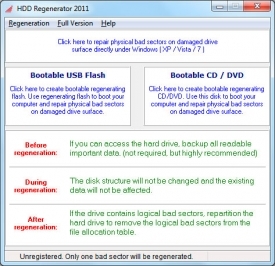 HDD Regenerator essentially regenerates your hard drive to a healthier state. The application tries to find a bad sector on your drive right after you start the application to give you a preview of what the program can do for you to restore your hard drive. It'll repair the bad sector and give you a choice of whether HDD Regenerator is the application for you to repair your hard disk and maximize it's lifespan. However, if HDD Regenerator cannot repair the bad sector you will be advise to replace this hard disk as soon as possible before you lose all of your data. This usually means the hard disk it just tried to repair is on the verge of dying and immediate action should follow to save all of your important and sensitive data that you would like to keep. A good thing about HDD Regenerator is that it is easy to use and you don't need to have a lot of computer knowledge to use it. It basically does everything for you and tells you what you have to do without any complex language you may not understand. So, even for novice computer users, HDD Regenerator can really benefit you if you see the value of your important files and want to make sure you keep your hard disk as healthy as possible to maximize it's life.